Big Sur is a very special place to many people. To help keep it that way and to help ensure your own safety, please observe some simple rules and follow these basic safety tips. Click here for more tips on Sustainable Moments in Monterey County. Visiting Big Sur? Here are some things you should know. Do Take Lots of Pics — Leave plenty of extra time to snap memorable photos along your journey. Use caution and safely use the parking pullouts on Highway 1 to capture epic snapshots of the Big Sur coastline. Don’t forget to share you pics using #SeeMonterey! Do Recycle — Most businesses have blue recycling bins. Please treat Big Sur gently and with respect so that it will remain the beautiful place we all love. Do Be Mindful of Poison Oak — This toxic plant is found in Big Sur in abundance. Exposure to the plant can be spread by hands, clothing, pets, or equipment which has come in contact with the plant or from the smoke generated when burning it. Much of the reactive substance can be removed by immediate washing with cool water and soap. Look for the triple leaf pattern, with prominent veins and a shiny surface. During the summer and fall, the leaves take on reddish hues. Try to avoid this plant. Do Respect Private Property — Please be mindful and respectful of the property rights of others. Most of the land adjacent to the highway is posted private property, and trespassing laws are strictly enforced. Don’t Start Fires — The biggest concern during the dry season are wildfires. Please extinguish cigarettes in your ashtray. Be extra careful, making sure that your fire is safe and legal. Be sure to extinguish your fire when you leave. Don’t Collect — Plants, animals, rocks and artifacts of Big Sur’s cultural and natural history are protected by law and should not be disturbed. Rockhounding and collection of driftwood and firewood may be allowed in certain designated areas. Collectors should contact the nearest ranger station for specific information. Don’t Set Up Camp on the Roadside — Roadside camping is prohibited along Highway 1 from the Carmel River to the Monterey-San Luis Obispo County line as well as Nacimiento Fergusson Road. This does not apply to tired motorists stopping for a temporary rest. Illegal campers will be cited! Don’t Treat the Side of the Road Like a Restroom — Public restrooms are scarce along Highway 1 so be sure to make a pit stop in Monterey or Carmel beforehand. Restrooms at California State Parks within Big Sur are also open to the public. Click here for a list of public restrooms in the Big Sur area. Don’t Let Pets Run Wild — In State Parks, pets must be on a leash at all times and are not allowed on the trails. On US Forest Service lands, pets must be leashed in developed campgrounds, picnic and day use areas. This is not only for their safety but for other visitors including hikers and local wildlife, which can be intimidated, injured, or killed by unleashed pets. 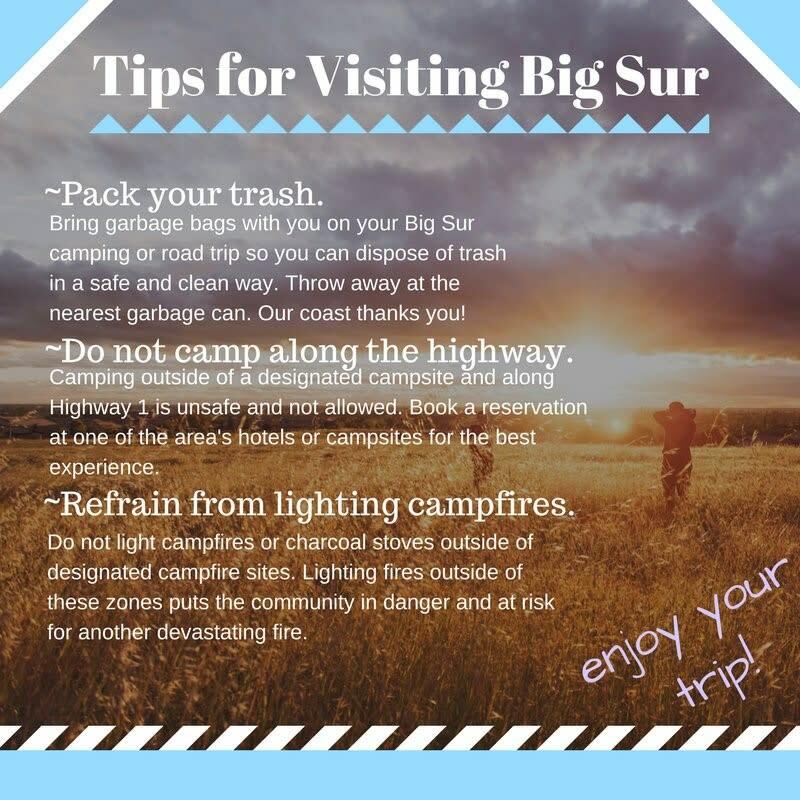 Visit the Big Sur Visitor Guide and Love, Big Sur websites for more travel tips.